Page Master Designs Online: SP & Co & MarkerPOP Blog Hop! SP & Co & MarkerPOP Blog Hop! Hello everyone and welcome to the MarkerPOP! + SP & Company - Tina Wenke Collection Blog Hop!!! MarkerPOP! is the home of premium markers plus lots more! SP & Company is the home of cute and fun photopolymer stamps (made in the USA! ), die tools, and a color line of buttons, ink and more! 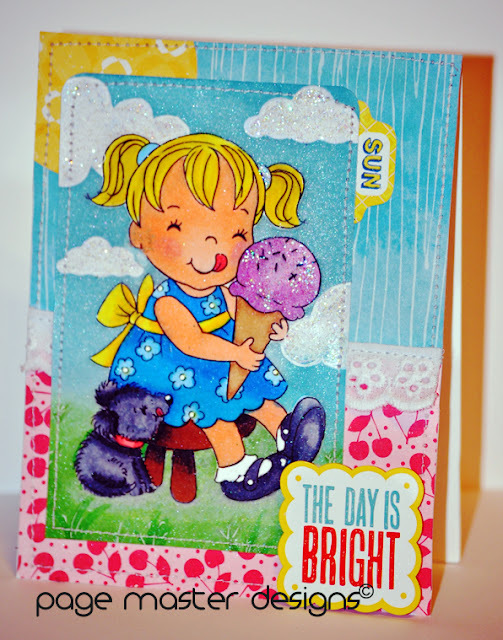 Today we are teaming up to share some amazing projects using some of the awesome new stamps from the Tina Wenke Collection from SP & Company along with some of our favorite coloring tools from MarkerPOP.com. If you are just joining us on the hop, you are going to want to start back at the beginning of the hop list which can be found at the end of this post! I created two cards for today. I just LOVE Tina's designs and I couldn't pick just one. I started with this little cutie her name is Annie and the stamp is called "Annie Eating Ice Cream"
Next up I have another adorable stamp: "Bird with Balloons" I LOVE this one too. I am going to redo this technique on watercolor paper tomorrow. Because I didn't do this on watercolor paper and because I was afraid of bleed I colored him and the balloons with Prismacolor Pencils. I masked the image off as I finger stamped and it came out perfect. No bleed what-so-ever. We have TWO great prizes up for grabs. One sponsored by MarkerPOP! and one from SP & Company! Visit the blogs on the hop list below and leave a comment on their Blog Hop post. TWO winners will be randomly selected from all comments left. The more you comment on, the better your chances of winning! Hop will run through Tuesday, June 25th at 11:59pm EST. Blog Hop winners will be announced Wednesday, June 26th! Wow! 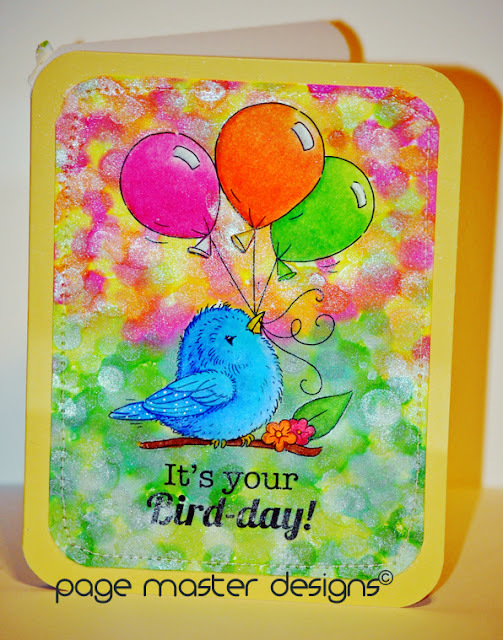 Such bright and cheerful cards! Thanks for the chance to win! Oh these cards are beautiful! The cards are doubly delightful. Love that background technique on the cute birdie card and the glittery background on the ice cream girl card. Great paper choices and layering on the first card, not to mention the stitching on both cards. Great coloring on both cards. I would be very upset if I were forced to choose between them because I wouldn't be able to. These are gorgeous! Great coloring and fab papers! Such gorgeous cards! So bright and cheery! Such adorable stamps! Love how bright and colorful your cards are!! Interesting technique. Thanks for sharing! Happiness is a bright cheerful card!! Double happiness came on your page with your two cards. Love them both, but am a little partial to the birdie. GORGEOUS !! 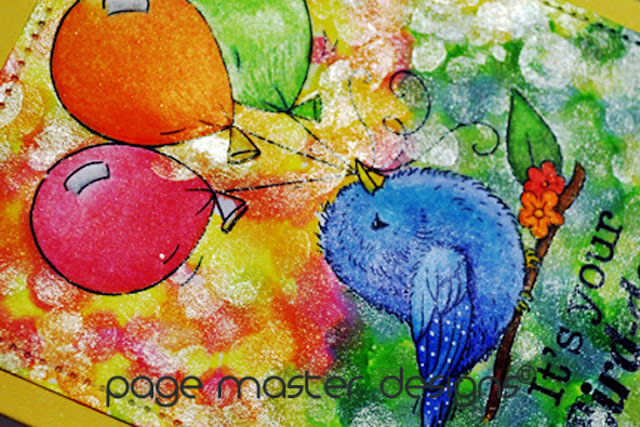 I am blown over buy your coloring... both card are beautiful and now I have to have Annie and the little birdie !! Loving this blog hop! The glitter is such a cute idea. It is a nice addition to your card. How sweet. The cherries and wood grain look really cute with the girl and her ice cream. What a good job you did. Thank YOU for sharing the technique you used! Beautiful work!! That little girl is so cute and I love the background on the birdie card. Love all your bright and cheerful colors. The technique with finger stamping sounds interesting. I'm going to have to try this. Wow! Your cards are so bright and cute! I really like this new "finger stamping" technique! Your example turned out awesome! Now I want to try it! Thanks so much! Super adorable cards. Love those colors and all that sparkle.